Students at UNC Chapel Hill have fought long and hard to make a Confederate statue called “Silent Sam”, a thing of the past and even toppled it in protest. So, news of the university’s plan to bring it back to life is causing heated resistance on campus and has ignited more protests after it was revealed that the university plans to erect the statue inside of a new $5 million facility, The Huffington Post reports. Tensions were high as several hundred students took to the streets on Monday to rally against the planned resurrection of the statue, whose very presence some consider racist. 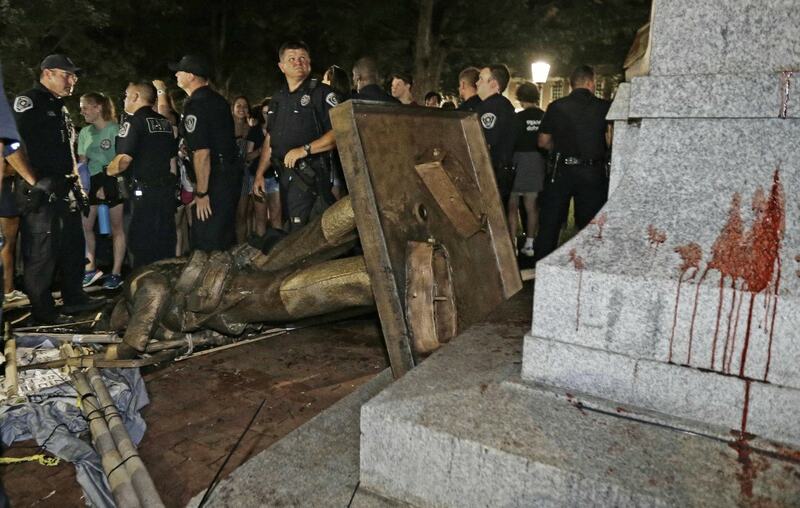 “It’s time to tear down ‘Silent Sam.’ It’s time to tear down UNC’s institutional white supremacy,” Maya Little, a UNC doctoral student who has led the fight earlier this year and was even arrested fighting to get the statue removed. Police showed up in riot gear and were met by dozens of students who yelled chants “Stand up, fight back!” as they marched through the university campus. At issue of the announcement from school leaders on Monday, who revealed a plan to build a $5.3 million “History and Education Center” to safely house Silent Sam and other artifacts on campus, the outlet reports. The Center would be in a new, free-standing building with state-of-the-art security and outstanding programming,” said a statement issued by the office of Chancellor Carol Folt. Folt contends that it was the “best legal option” in “preserving the monument and its history” for the university. “We have a long and important history to tell, and the Center will offer us an excellent opportunity to tell it all,” Folt’s office said of the plan. Students however blasted the school saying it was proof that the university was just working to preserve its racist past. “They are building a safe space for white supremacy and forcing us to pay for it,” several student groups, including UNC Black Congress and Defend UNC, said in a statement.